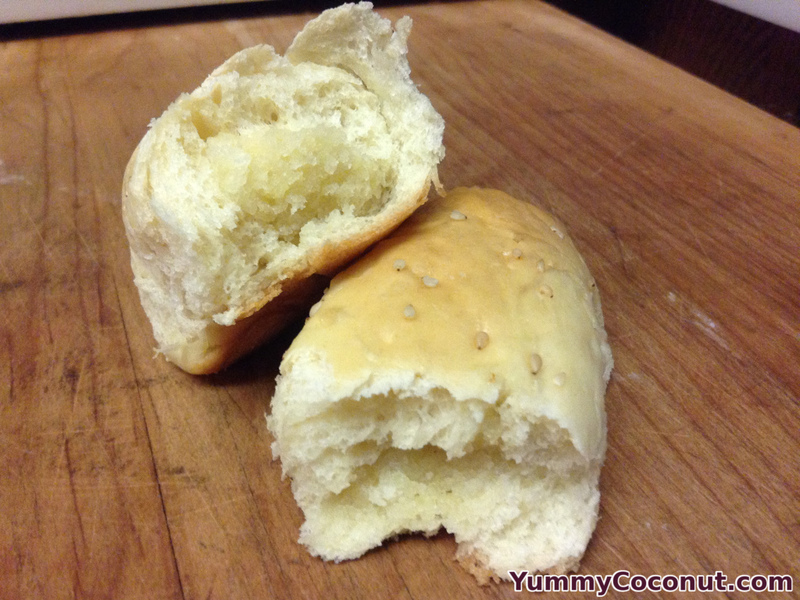 Follow this recipe and make delicious Gai Mei Bao (sweet coconut filled Chinese rolls) in the comfort of your home. Stir yeast, 1 cup of warm water and the sugar in a bowl. Set aside for 5-10 minutes to make sure the yeast is still active. In a separate cup, place the hot water and the sugar. Stir until the sugar is dissolved. Let cool to 100-110° Fahrenheit. Once cooled, combine the yeast and the sugar water. Add the rest of the ingredients except for the flour. Slowly work the flour into the mixture until a soft dough forms. Knead 10 minutes or until smooth and elastic. Place the dough into a greased bowl, cover and let sit until it has doubled in size. Remove the dough, shape it into a roll approximately 12 inches in size and cut into 12 even pieces. Using a food processor or spice grinder, blend the coconut and sugar until the texture is fine. Add the rest of the filling ingredients and mix to combine. Shape each dough piece into a rectangle, approximately 6 inches long by 4 inches wide. Separate your filling into 12 equal portions. Place a ball of filling into the center of each dough piece and shape the filling into a rectangle, leaving an inch of space around all sides. Close the dough by pulling in the sides and pinching them together in the middle. Close up the tops and bottoms. 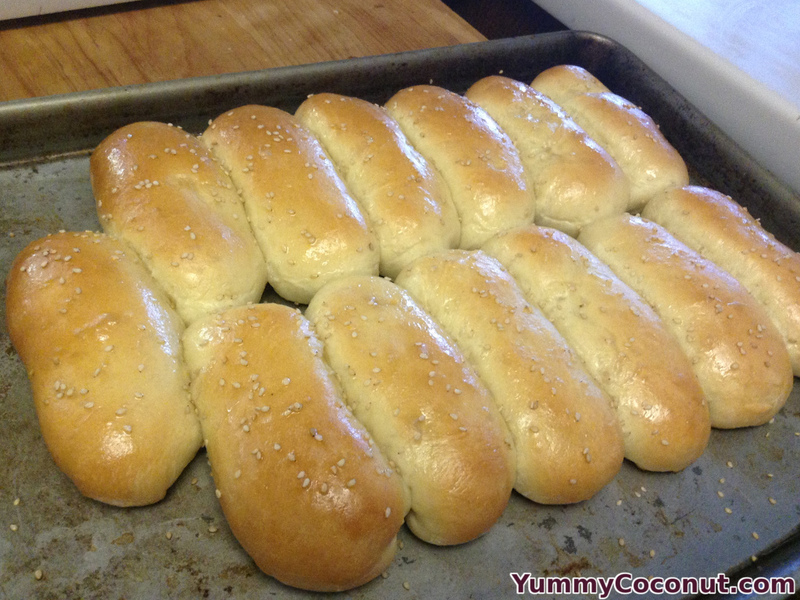 Place each bun seam side down on a baking sheet about an inch apart. Cover the buns and let them rise one hour. Heat your oven to 350° Fahrenheit. Beat together the egg wash ingredients and brush over each bun. Sprinkle sesame seeds over the tops of the buns. Bake 15-18 minutes or until the buns have turned golden brown. Mix together the ingredients for the honey wash. Remove from the oven and brush with the honey wash. Hot water and live yeast do not mix. You can kill your yeast if the water is too hot, so make sure you check the temperature. The water should feel lukewarm, or just barely warm to the touch. The measured amount of filling in this recipe is about equivalent to what you would find if you bought these bao from a bakery in Chinatown. Feel free to double the filling recipe and shove all the extra filling into the 12 bao for an extra treat. It will take a little more work to get the dough to seal around the filling. The dough will take less time to double if you keep it warm. You can turn your oven on to the lowest heat and let it preheat for ten minutes and then shut the heat off and place the dough inside. On the same note, the dough will take longer to rise if it is chilly. You can tell if you yeast is alive, if it starts to make bubbles in the warm water. After about ten minutes of time in the warm water and sugar mixture the entire mixture should be frothy. If your yeast does not look active after ten minutes, toss it and try again with new yeast. Two teaspoons of yeast is equivalent to one quarter ounce package of yeast. If you are kneading the dough in an electric mixer, you will need to knead approximately one quarter of the time, so around 2½ minutes instead of ten. Be careful when processing the coconut and sugar to a fine consistency. This should only take a minute or two of short, 5-10 seconds pulses. If you process the coconut for too long you can turn it into coconut butter instead of just finely shredded coconut. If you want to use sweetened coconut, omit the sugar in the filling.